I originally posted this guy the other day when I did my week's worth of hobby post. He's one of the last pieces in what my Client and I call "Round 2" of his huge commission. 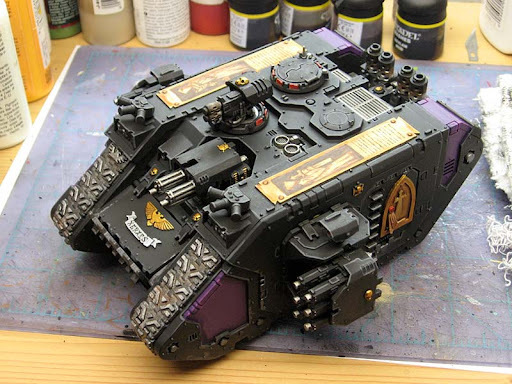 I've already done one Land Raider Redeemer for him and this makes the second tank in the force that I've painted up. I thought I might go into the model a little more here and show how I got the finished result. It's your stock Crusader except for the Assault Cannon and multimelta, both of these were kitbashed. Those and the "gold shrines" are all that make this different really. I've found it doesn't take much to make a model stand out, just a slight change here or there and you've got something unique. 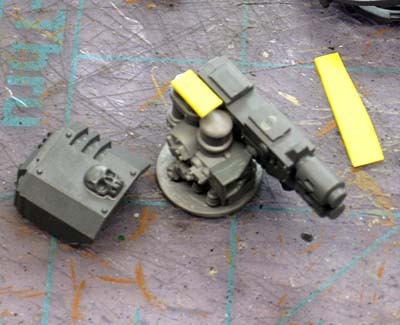 As for the assault cannon, it was a matter of not having the turret for the weapon. 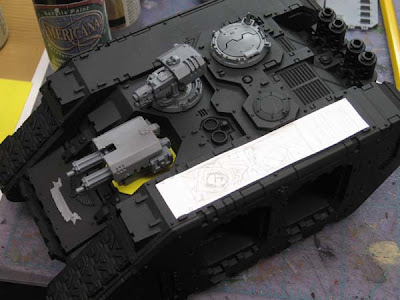 I just covered the opening on the tank with plasticard and used a few bits to build a new weapon. I used the plastic twin linked assault cannon and some kind of sensor array with the antenna cut off together along with a cover. The multimelta was done pretty much the same way. On this tank, I didn't want to have a guy sticking out the top hatch. The other tank already has that and I didn't want to detract from the gold plating on the top. I used a plastic mutimelta from an attack bike, the sensor thing that comes with terminators I believe and another cover. 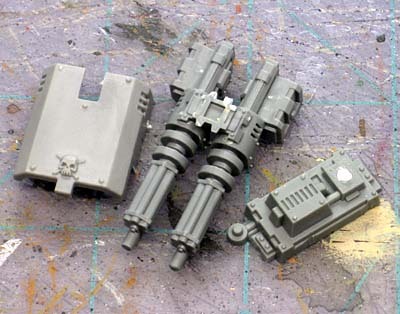 There's the front sight to a space marine missile launcher on there too for good measure. The round bottom of the sensor thing fit perfectly into an open hatch with just the slightest bit of shaving around the edge. The gold plating on the top came to me at the last minute. 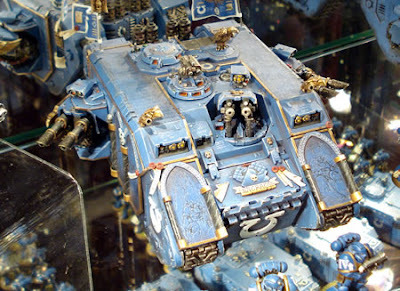 I'd seen pics before of a Land Raider for Marneus Calgar. 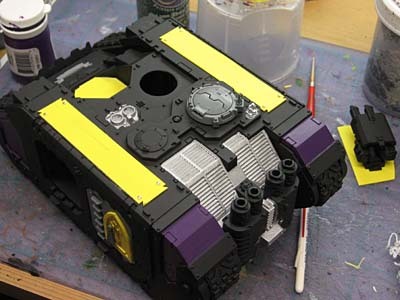 Very cool model but a little more than I could do with this one since it came to me already built.The pic below of it comes from Felix's Gaming Pages Blog. One day, I will build that model. But that's another story. I thought, wouldn't it be cool to build something that reminded me of Calgar's ride... something very royal and important looking. I figured a small shrine on each side door and these massive gold plates bolted to the top that have some battle image and inscriptions on them in memory of some previously fought war or something would be perfect. I did a quick "mock-up" with paper and sent the idea to my Client in hopes that he would sign off on it. As soon as he did, I built the side door shrines and added the gold plates to the top of the model. 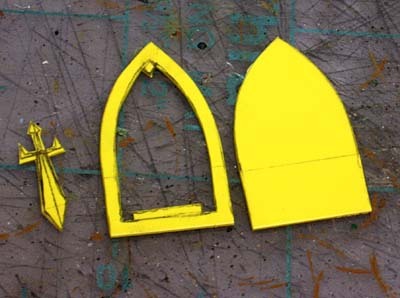 The door shrines are nothing more than a little bit of plasticard. I made an appropriate looking shape and repeated the chapter symbol in the middle of it. I also added some purity seals for good measure later on. And the gold plates on top are nothing more than a simple piece of plasticard with some rivets added at the corners for effect. Now, it was just a matter of coming up with some actual images for the shrines on top of the Crusader and then painting this thing. Part 2... here it is. Very pretty. The shrine is simple but very effective. I might put something similar on something I'm building for my wife. Mercer: It was just too much to squeeze in one post. The painting is where it's at. Yes looking at the build it making me want to build something when i get home. Not sure what just yet but looking at what you have down with this it makes me want to hobby. Curse you Ron. Those simple additions really add to the model, this really gives me some inspiration for my Imperial Fists when I get to them. I'm feeling insprired by your posting Ron! I like the way you've executed this build and complemented it with a top-notch paint job. Splendid work sir!